I am trying to find an example where happiness causes stress. As of today, I have found no other pages on the web that say "happiness cannot cause stress", but there are [11 Google][9 Bing] unique results for "happiness causes stress" (Google says 330 results at first, but as soon as you go to the next page it says how they are all very similar to the first 11). The results for "happiness causes stress" show there are a few spam sites, happiness causing stress for others, social happiness, and one interesting result of "the pursuit of happiness causes stress". No results indicated any example of happiness causing stress for an individual. Happiness and stress can occur at the same time. BUT, the reason for the happiness is not the same reason for the stress. Ex: Your favorite sports team is ahead a few points in the finals. You should be happy that your team is winning, but you may be stressed because it is a close game that could still go either way. I am very open to hear rebuttals. I've already talk to a few others about this and there seems to always be another cause for the stress that isn't the happiness itself. Ex: You got into grad school. You should be happy that all of your hard work finally paid off, but you may be stressed because you know there is even more hard work coming up and you aren't 100% that you will get all the way through it. A common denominator for stress in these examples seems to be the unknowing of the future; anxiety. Once you know the real root for the cause of stress, it should be easier to overcome and start relaxing more. One idea to get you started is to not worry (or worry less) about things you have no control over. For those times that you want to be a little creative (or don't have any jelly left), feel free to put peanut butter on one side of a slice of bread. On another slice, put some chocolate syrup. Step 3, put the two pieces together and Enjoy! Somehow eBay is more trusted than Craigslist, but with eBay you are sending your item farther and still don't know the person. But, I guess, it's because there is at least a seemingly mediator for the two parties. 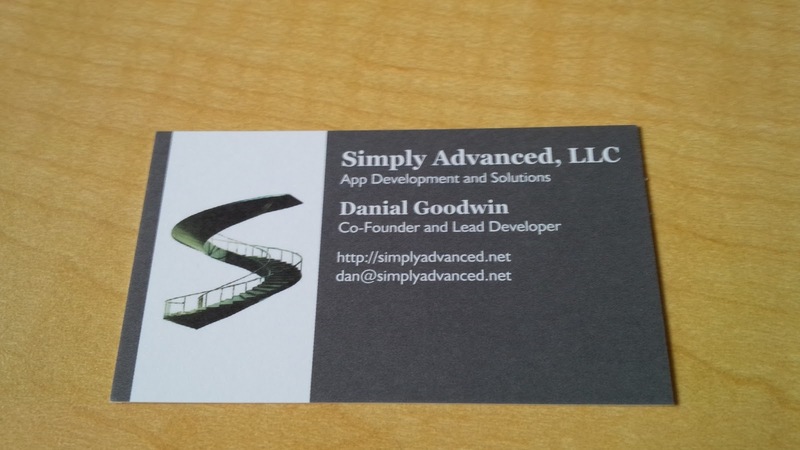 I recently got my supply of 250 business cards from VistaPrint. They are pretty good quality. I will most likely order from them again, unless I hear of another really recommend company to buy business cards from. Difference between a service company and a product company: The first is easily scalable. Build something that does one thing really well. Difference between a huge market and the right market. "The trend is your friend" when asking for venture capital. Current trends: mobile, cloud, big data, and social. Describe your service/product better. Better doesn't mean specific, it means making an impression. Ex: My service is the oracle of big data. The words you should use evolve with time and with usage by others. The best copy now should use just one of the following: comprehensive, genuine, convenient , accessible, prestigious, premier, pioneers, quality, we obsolete . Other terms should be purposely excluded because they are either overused, not true, or sound templated: innovative, groundbreaking, fresh, leader, unique. It is tough to know which words to stay away from; you don't want to make people doubtful and put their defenses up. One tip is to keep up-to-date with everything investors, businesses, and consumers see. There are always tradeoffs. Know them. "People who get MBAs learn how to draw timelines." The ability to communicate effectively is your strongest asset. When building for businesses, the ultimate goal is to either raise revenue or reduce costs. "Engineers are not hired to create programs, they are hired to create business value." Any more quick thoughts? What are your first thoughts? Then what are your second thoughts? Also, http://valleywag.gawker.com/investor-to-kids-a-startup-job-is-the-new-office-job-511011154 does a great job in writing an article about it. My main thought is that it is a great line to keep in mind when I am in my own personal startup. I have to remember that having my own startup wasn't the ultimate goal. There is something that I want to do with it. "A Startup Is Just A Means To An End"
I don't always want to impress my thoughts unto others, I'd just prefer others to think for themselves and truly understand both/all sides of an argument/view better. That's why I'm not going to go into details of this article that I just read. It doesn't matter what the source is, just that it presents readers with another perspective. 1. We're Not Programmed to Seek "Truth," We're Programmed to "Win"
Maybe, maybe not. But, it is a good read.